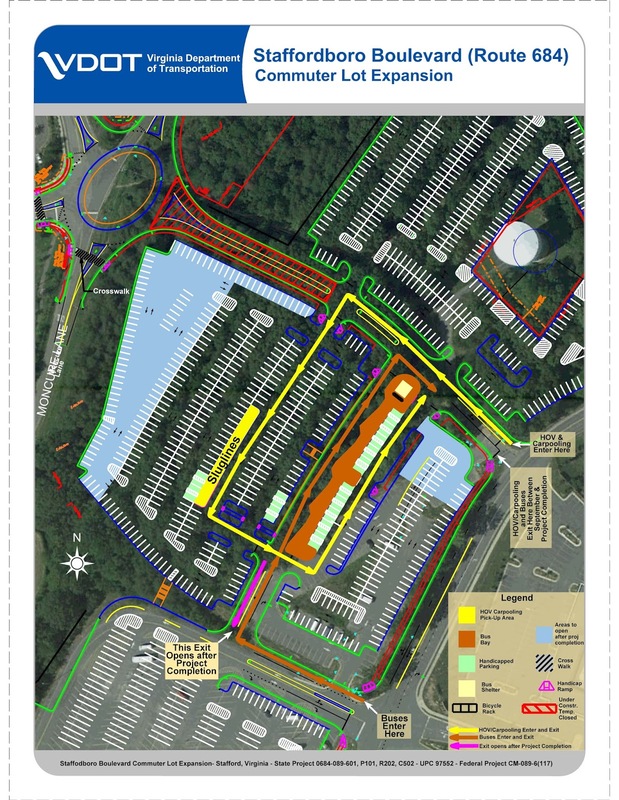 Finally, the long awaited expansion of the park and ride lot on Staffordboro Blvd. is now open for use! This parking lot is a giant bonus to all sluggers, this way there will be more space for riders to park. Drivers now have access to more slugs to pick up and get on the HOV lanes. 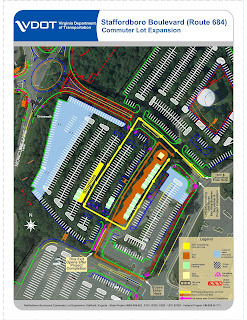 Staffordboro parking lot had about 882 parking spaces shared by the Martz bus riders, vanpool, carpool and slugs. This parking lot was so popular, that many commuters from the south of Stafford parked here to slug to common destination like the Pentagon, Rosslyn, and L’ Enfant Plaza. The lot gets filled up at about 7:00 AM on workdays and slugs had to illegally park in the parking lot or nearby shopping complex; risking getting ticketed. Because the lot gets full early some of the Stafford county residents had to go about 10 miles north to 234 or Horner road parking lot to find a parking space there. Thanks to the VDoT for spending about $10 million to add 912 parking spaces and continuing to allow residents to park for free. So, why sit in traffic when you can be sitting at work already? So, drivers fill up those empty seats! It is 5.35 AM early in the morning, and I see slugs already lined up at Horner road. A few cars picked up slugs. 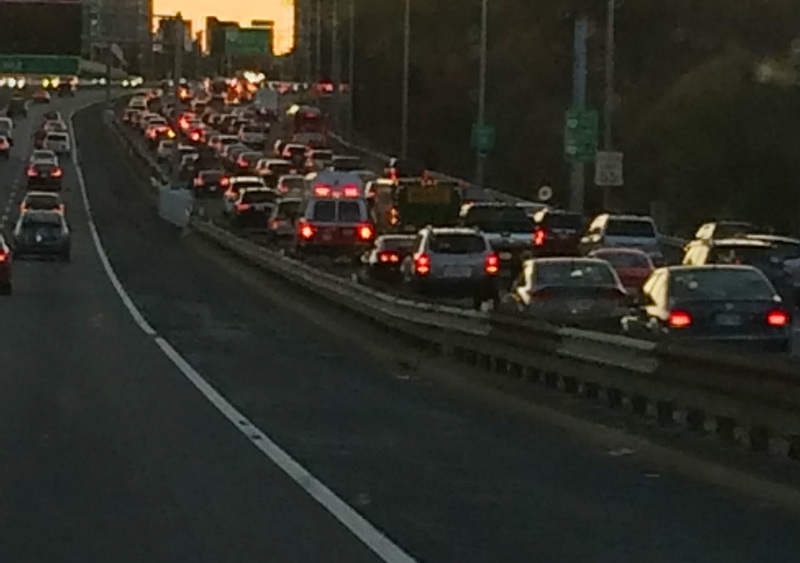 While others rushed to hit the HOV lanes before HOV enforcement goes into effect so that they can drive solo. With the HOT lanes becoming effective in December 2014 it is likely that drivers will be compelled to pick up slugs beyond the HOV enforcement timing. It is said that the dynamic tolls may range from $0.20 to $1.25 per mile depending on the traffic to drive on HOV lanes. Drivers can save time and toll if they prefer using HOV. So, who wants extended sluglines? Starting from December 2014 the new rules issued by the Virginia Department of Transportation (VDoT) will go into effect on the improved I-95 HOT Lanes (aka Express Lanes) between Route 610 in Stafford County and Edsall Road in Fairfax County. The new rules state that all commuter vehicles (except motor cycles) will require an EZ Pass or E-Z Pass Flex in order to be able to use the High Occupancy Toll HOT Lanes. - About 10000 Hybrid Vehicles with clean fuel plates that were using I-95 HOV lanes as Single Occupancy Vehicles (SOV) during the peak hours will have to pick up slugs or pay toll. This may increase the demand for the slugs. - Drivers that are waiting on the ramp so that they can get onto HOV lanes after HOV enforcement are out of luck. They have to pick up slugs or pay the toll to use the new HOT Lanes. This may extend slug lines past the peak hours. With the new rules going into effect as soon as the 95 Express Lanes open in December, there is complete certainty that these impacts will definitely affect slug lines. However, all those vehicles with the EZ-Pass Flex will benefit from the freedom to use the HOT lanes for free when they pick up slugs or pay the variable toll between $.20 and $1.20 per mile based on the volume of traffic and zone. You’ve been there, sitting in traffic on the highway while enviously glancing over at the HOV lanes watching cars fly by; while you’re dealing with the anxiety of bumper to bumper traffic, breathing in car fumes for miles behind the wheels. Commuters from I95 corridor to Washington DC have a reliable option to pick slugs on both ways while others working at Tysons corner, Virginia or Andrews Air Force Base, Maryland do not have much option. Now VDOT provides additional choice for Northern Virginia commuters to get on High-Occupancy or Toll (HOT) lanes, which is an extension of the existing HOV lanes. Toll will range from $0.20 to $1.25 a mile on HOT lanes depending on the traffic. The rates will be locked when you enter a segment and you have an option to exit toll lanes to regular lanes. VDOT in partnership with Transurban-Fluor has constructed additional capacity between Springfield, Virginia and Stafford, Virginia to accommodate drivers with less than 2 riders. The new I95 HOT lanes will add an additional lane to the existing two lanes that makes it a three lanes outside beltway. I95 HOT lanes are set to open in December 2014 which will, continue to be reversible lanes northbound during the morning peak hours and south bound during afternoon peak hours. Of course, drivers from I95 corridor to Washington DC who like to drive solo or still afraid of picking up slugs can use HOT lanes outside beltway. You all know the annoyance of traffic, why not try sluglines and save yourself some time and money.